This analysis was written by CBS News political consultant Monika McDermott. Sen. Barack Obama sailed to an easy victory in North Carolina, while Sen. Hillary Clinton edged him out in Indiana. National exit polls conducted for CBS News by Edison / Mitofsky. Research show that each candidate retained the bases they have held throughout the primary season, with state characteristics making most of the difference. The most intriguing story about the Democratic primaries in Indiana and North Carolina, however, is actually about non-Democrats - Independents and Republicans. While self-identified Democratic voters continue to express support for both candidates as the nominee, and overwhelmingly support each in the general election, the story changes among others who showed up to vote today. While much has been made about polarization within the Democratic party, as evidenced by the primary electorate, much of the apparent division can be attributed to voters who do not actually consider themselves Democrats. Obama's ability to attract and motivate independent voters has been evident throughout the primary season. Indiana was no exception. In the state's open primary, 23 percent of those voting in the Democratic primary were self-identified independents, and 25 percent were voting in a presidential primary for the first time. Obama won the overall independent vote 53 percent to 47 percent. In North Carolina the story was different in terms of the vote choice. Clinton won independent voters in North Carolina by four points - 50 percent to 45 percent. These independents, who made up 19 percent of the primary electorate, were more conservative than those turning out in Indiana, 26 percent conservative to 18 percent respectively, potentially accounting for the difference in the results. The good news for Obama among North Carolina's independent voters, however, is that he may be better able to hold their votes in the general election than is Clinton. Only eight percent of Obama supporters in North Carolina said they plan to vote for Sen. John McCain if Obama wins the nomination. In contrast, 26 percent of Clinton's independents voters would defect to McCain even if she were the nominee. Despite the difference in the vote tallies between the two states, independent voters in Indiana and North Carolina had many similarities. Both made up substantial portions of each primary electorate, one-fifth in North Carolina and nearly one-quarter in Indiana. Yet, despite their choice to join the voting in their state's Democratic primary, sizable numbers said they plan to vote for McCain in the general election, especially those who support the candidate not in the match-up. They are also much more likely to be dissatisfied with one or the other candidate as the party nominee than are self-described Democrats. In North Carolina, nearly one third of independents (32 percent) intend to vote for McCain in the general election if Clinton is the Democratic nominee. Similarly, 28 percent of independents would support McCain against Obama. In contrast, only six percent and 12 percent of Democrats would defect to McCain against each Democrat respectively. In Indiana the numbers are somewhat smaller, but still substantial - one-fourth would vote for McCain against Clinton, and one-fifth would do so against Obama. Democratic defections would be, as in North Carolina, six percent and 12 percent respectively. Much of these results stem from deep divisions in independents' willingness to support the opposing Democratic primary candidate in the general election, again demonstrating the polarization many have attributed to Democrats. Among Clinton's independent supporters in North Carolina, 44 percent would vote for McCain over Obama, and among Obama's independents, 35 percent would defect in the general election if Clinton were nominated. Independents are also much more likely than Democrats to express dissatisfaction about either candidate as the eventual nominee. In North Carolina, 40 percent and 38 percent of independents would be dissatisfied with Clinton or Obama, respectively, as the nominee. In Indiana the proportions were 36 percent and 32 percent. Democrats themselves are less divided. For example, in North Carolina 33 percent of Democrats would be dissatisfied with a Clinton nomination and 25 percent with an Obama one - 18 points and 14 points less than independent voters. If independents demonstrate divisions among the Democratic candidates' supporters, Republicans demonstrate yawning chasms. Few of the self-described Republicans who turned out to vote in the Democratic primaries in North Carolina and Indiana seem to actually support the candidate for whom they voted. Perhaps most intriguingly, however, is an apparent effort by Republicans to promote Clinton's candidacy when they feel Obama is the better nominee. In each state Clinton carried the vote of Republican voters - 52 to 44 percent for Obama in Indiana, and 61 to 32 percent in North Carolina. Republicans made up only 5 percent in North Carolina's Democratic primary electorate, but made up 11 percent of the vote in the Indiana Democratic primary, enough to provide Clinton's expected margin of victory. While taking the time to turn out and vote in the Democratic primaries, Republican voters in both states have plans to vote for McCain in November. In North Carolina, 74 percent and 76 percent of Republicans said they would vote for McCain if Clinton or Obama, respectively, were the nominee. 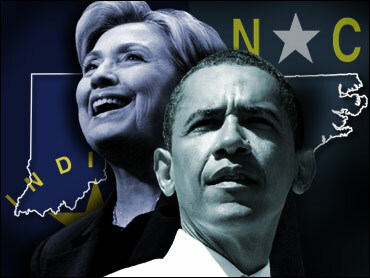 In Indiana, 66 percent would vote for McCain against Clinton, and 61 percent would vote McCain if Obama's the nominee. The exit polls reveal striking evidence of strategic voting by Republicans in both primaries, voting for the candidate they find least likely to win. Even though a majority of Republicans in each state voted for Clinton, they give Obama the better chance in November. In Indiana where 52 percent of Republicans supported Clinton, only 37 percent think she is more likely than Obama to win in November. In North Carolina the results were similar - while 61 percent of Republicans voted for Clinton, only 48 percent think she is the better general election candidate. Finally, these voters are participated in a primary in which majorities would be satisfied with neither candidate. In North Carolina's Democratic primary, 60 percent of Republican voters said they would be dissatisfied with an Obama nomination, and 53 percent would be dissatisfied with Clinton as the nominee. In Indiana, 51 percent would be dissatisfied with Obama as the party's nominee, and 56 percent would feel the same about Clinton should she win. Monika L. McDermott is assistant professor of political science at the University of Connecticut, where she teaches and conducts research on voting behavior and public opinion. Before joining the University of Connecticut, McDermott worked in election polling for CBS News and the Los Angeles Times. She holds a Ph.D. in political science from the University of California, Los Angeles. The National Election Pool Exit Poll was conducted by Edison/Mitofsky. The North Carolina poll included 2,241 voters. The Indiana poll included 1,660 voters interviewed as they left the polls. The margin of error for each survey is two points.